Currently based in Texas, Tammy Gomez is a poet, multimedia performer, and playwright/director. As award-winning poet (Best Poet of Austin, Austin Chronicle, 1997), she has performed throughout the U.S., and in Mexico and Nepal. Her poems and essays are featured in numerous collections, including Yellow Medicine Review (2009) and Women in Nature: An Anthology (Louise Grace Publishing, 2014). Tammy is profiled in “Las Tejanas: 300 Years of History” (UT Press, 2003), and is featured in “Voices from Texas”, a PBS documentary film about Latino poets in Texas. Sound Culture has partnered with many arts organizations, including: Mexic-Arte Museum and Gallery (Austin); the Santa Fe Playhouse (Santa Fe); Oak Cliff Cultural Arts Center (Dallas); WordSpace (Dallas); Arts on Tap, Inc. (Fort Worth), Mexican American Cultural Center (Austin); and Contemporary Dance/Fort Worth. Tammy earned her Bachelor’s Degree in Psychology and Pre-Legal Studies from Goucher College (Maryland) and twenty-five years later was awarded the Goucher College Alumnae/i Award for Excellence in Public Service (2010). She studied literature and writing with Chicano greats Lorna Dee Cervantes, Jose Montoya, Raul R. Salinas, and Octavio Solis. She has been artist-in-residence at the University of Nebraska-Lincoln, University of Urbana-Champaign, Texas A&M-Kingsville, and Headlands Center for the Arts (Sausalito, CA), and has received grants from Humanities Texas, the Ford Foundation, the National Association of Latino Arts and Culture, the Puffin Foundation, the Writers’ League of Texas, Moonifest Foundation, and the City of Austin. In 2007, Tammy premiered her first full-length play “She: Bike/Spoke/Love”—on World Car-Free Day. 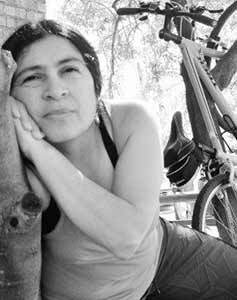 Her one-woman show, “Saliendo Abierta” (Emerging Open), was presented at the Out of the Loop Festival and Rose Marine Theater, and was later broadcast on Fort Worth Cable Community Television throughout September 2010. She has taught poetry writing and performance workshops in Nebraska, Illinois, California, and Texas. She curated the Poetry Tent readings for the Texas Book Festival for six consecutive years. Tammy has lived in the mountains of New Mexico and Colorado, completed an introductory Permaculture Design course, and trekked up to see Mt. Everest in Nepal in 1999–all of which have shown her ways of living conscientiously on the earth. She is an urban gardener who has not owned a car in eight years, and bicycles everywhere.